TactSlider is an amazing product that transforms your awkward on-screen touch control pad to a responsive, analog controller. If you previously hated how your thumb sometimes squeaks across the screen and not being able to accurately position where you would want your character to be, TactSlider is the answer. It improves gaming on your touchscreen device, offering you that additional level of precise control and response. TactSlider is designed by Daniel Quek, and is manufactured and distributed by BTX. Making it’s announcement at CES 2013, it made impressive waves in the mobile and gaming community. What’s awesome about the TactSlider is that it requires no special software, no batteries, and no additional parts or wires. Just attach it to your screen and start playing. It has a special adhesive back that is non-sticky, yet adheres strongly to a flat surface. To remove it, you just have to pry a corner and it pops off, without leaving any residue on the screen. It worked well with my Galaxy S3’s screen protector, which is of a rubbery type material (XtremeGuard) and I also tried it on other standard screen protectors too. I was impressed with the build quality of the TactSlider. 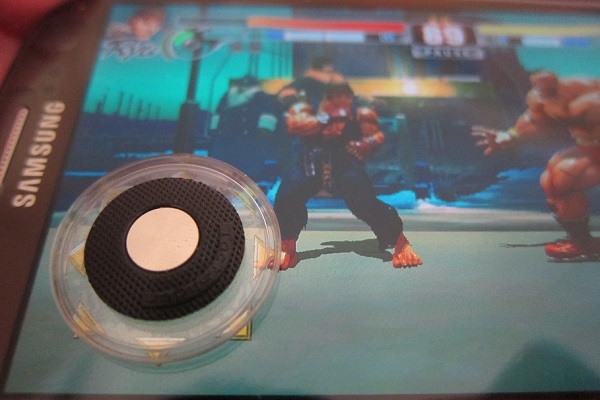 The spring design allows for the auto-centering feature unique to an analog stick and the hard hard rubber layer that surrounds the conductive core, helps provides sufficient traction and response when using it. I love the joystick. It snaps back into position just like a proper controller would. Flip the TactSlider around and you would see the interesting spring design that allows for this. It’s a clean and brilliant design. On to games, I loaded up Street Fighter IV on my Android device and control on it was a marked improvement compared to the virtual gamepad. It was easier to do Zangief’s 360-degree piledrivers and Ryu’s Shoryukens with the TactSlider. Initially, I had some problems with charge-move characters like Blanka or Guile. I couldn’t execute the moves and I suspect it was due to the tension, I wasn’t able to execute the moves fast enough. However I soon got the hang of it and the TactSlider was more than able to “keep up”, it withstood rigorous motion without shifting its position on screen. 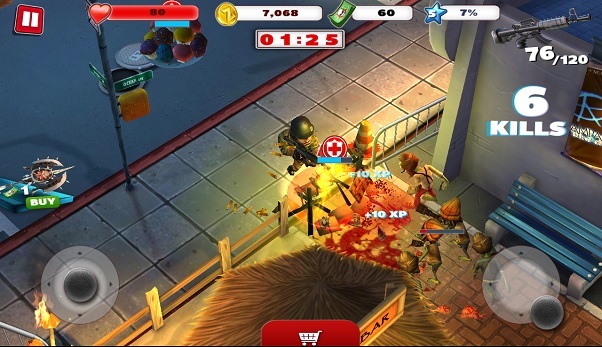 I next tried out a different genre of first person shooters on the Galaxy S3 and the iPad, ShadowGun and Dead Trigger respectively. Control on the S3 was great but on the iPad, required a little tweaking at the menu section to ensure that the on-screen gamepad matched that of the TactSlider. Enabling a non-fixed control pad in the menu section did the trick for me. The TactSlider worked as expected but it didn’t impress me as much. The precise control that is required is actually for the aiming reticle and not for the control pad. Primarily the control pad is only for forward back and strafe movement which isn’t too much of a challenge for the TactSlider or to use the on-screen controls. I did try attempting to stick the TactSlider on the aiming side (normally the right side of the screen) but there are often other control buttons there like your reload etc and it is too much of a trouble to use. The next clear option was to test out the Tactslider on dual-stick shooters, like Gun Bros or ZombieWood. These dual stick games are a good demonstration of the TactSlider’s capability, the traditional dual stick shooter genre thrives thanks to some innovative control rearranging. The TactSlider helps in the precise directional aiming as opposed to the onscreen controls, which more often than not, end up on me spraying bullets everywhere. Sport Simulation games were also a treat on the TactSlider. NBA Jam worked great with the TactSlider on both the Nexus 7 and Samsung Galaxy S3, with a high level of responsiveness. Dribbling down the lines or positioning your players to steal the ball or shove opposing team players out of the way was much easier as compared to using the on-screen control pad. Similarly, playing Fifa 12 and RealFootball 2013 with the Tactslider was also a joy as the device was significantly more responsive than the default virtual gamepad. Generally, as long as it works, I noticed a nice difference in my skill level on the games it was compatible with. You get more accurate control over your players with the analog stck, with the ability to more accurately position your players, having the control for those tight dribbles. Also, my thumb stayed in the game a lot longer because it doesn’t get sore from sliding on the glass (especially on a rubber-type screen protector! ), and you won’t accidentally move your thumbs out of the joystick control area, which is another major disadvantage to touchscreen games. I often find my players standing still as my thumb drift away from the onscreen touchpad. Well, on to the negative aspects, game compatibility. Not all games work. Tactslider have published a list of compatible games, available here. While there are a good number of games (100 and more and of the popular ones) that are already on the list, there are still some exclusions and there’s also device compatibility issue which seems to plague Android users more. For example, Metal Slug 3 works well when tested with the Nexus 4 but the onscreen controller was too large for my Nexus 7. This is the same problem for Wild Blood, which required the thumb to extend beyond the onscreen pad for the character to run. The next problem I faced was actually the design of the carrying case. It is more of a slight annoyance. While innovative, the back carrying case raised my phone profile and I was not able to lay my phone flat on the table. Instead it would prop up at a slight angle and my phone would wobble at a touch and not easy to type when laying the phone down. It would also vibrate a little jarringly due to the weird angle. You could also just carry the TactSlider separately in its case, which could then be kept in your wallet’s coin compartment. Mobile gaming on Android/iOS is definitely the future and I think it has already gone in front of traditional powerhouses, Sony and Nintendo. However, this also means that perhaps, traditional control types like the joypad may also start to lose its relevancy. Indeed, more innovative games are making use of touch inputs and accelerometers as alternative control. Case in point: Angry Birds. That being said, it is still not the time yet though, and there are a number of games that are best enjoyed with a traditional input type like the joypad-equivalent. I think US$19.90 is a fair price if you are an avid gamer of specific genre types that require the TactSlider. If you are such a gamer, the on-screen control just won’t do, and you are left with options such as an external controller (either through OTG, or Bluetooth, like the PS3 SixAxis Controller or devices like the Moga). There are also similar on-screen devices to the TactSlider such as Fling and Logitech. The Fling and Logitech joysticks involve the use of suction cups to stick to the screen and have poor reviews on them either sliding around or leaving marks on the screen protector. In that sense, the TactSlider is way better. The separate controllers have its advantages in terms of the overall control and also would not block the screen. However, you would need to weigh those advantages versus the weight, portability of the system and the challenges in pairing everything together. The TactSlider is available directly from the website at US$19.90, with shipping at an estimated US$5. Alternatively for Singapore buyers, it is also available from Atomware, a shop in Sim Lim Square, Lvl 5. Grab it quick before it goes out of stock again! GadgetReactor would like to thank the Tactslider folks for providing us a unit for review.